Watercolour is a wonderful medium for artists to start out with when learning how to mix and manipulate colour. Our instructors will teach you how to properly set up a palette, how to blend, which brushes to use in different instances, how to use a wash, and other techniques that will help you create successful watercolour paintings. At the beginner level, students will follow their instructor step-by-step through the creation of a traditional landscape or still life painting. 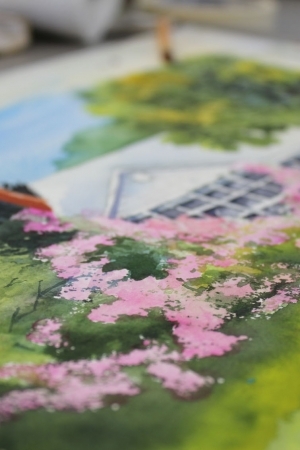 As students become more advanced watercolourists, they are encouraged to choose their own subject matter and are taught more about the advanced techniques that will allow them to create special effects in watercolour.